Can’t believe it’s Monday already … and November! I’m pretty sore today from yesterday’s mud run, my legs are making me pay for running way more hills than I’m used to. Okay, I can barely walk! But I’m one of those crazy people that actually doesn’t mind being a little sore, it reminds me that I’ve worked hard and am getting stronger. I completed the 5k obstacle-loaded course in 45 minutes which was pretty good for my age group, in the upper 20%. Not sure what kind of time I was expecting, I didn’t really set any goals for this 5k since I haven’t done anything like this before. But I knew my primary running shoes would be ready for retirement after the race, they were pretty close already and being saturated with water and mud sealed the deal. Still being relatively new to distance running, I’m still looking for the perfect shoe and a rookie mistake I made with the last pair was I bought them at my size. Not a problem for short runs, but I discovered my feet swell during longer runs and had issues with cramped toes and pressure. Towards the end of a half-marathon, my feet felt like they were on fire crammed into my shoe. Turns out I should have purchased them 1/2 to a full size larger. 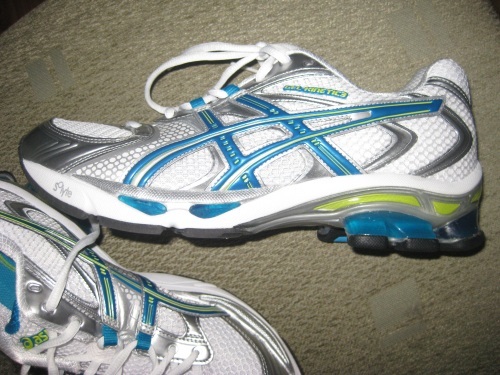 After a lot of research, I decided on ASICS GEL-Kinetic 3 a half size larger than I usually wear. After the mud run yesterday and snacking on toasted pumpkin seeds from my carving adventure, I was simply craving a monster salad for dinner. 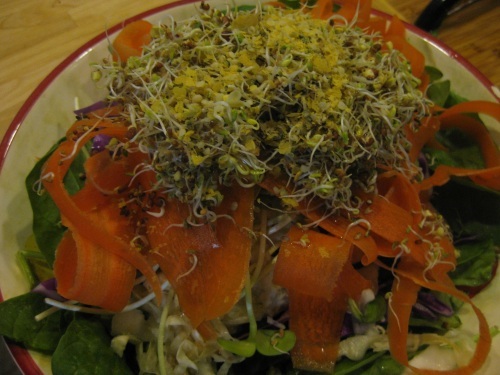 This one loaded with spinach, sauerkraut, carrots, sprouts and red cabbage. 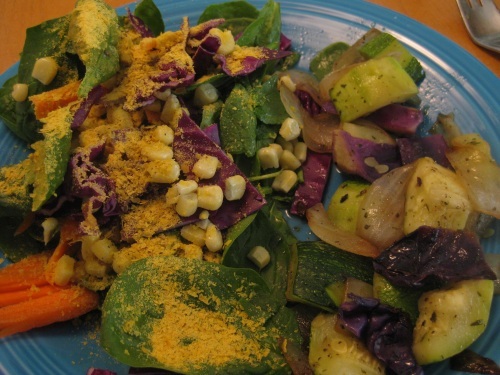 Then more salad with lunch today with a side of sauteed veggies. I was on veggie overload … wait, that’s everyday. For dinner tonight I was craving curry and had dried chickpeas soaking in the fridge ready to go. As much as I enjoy chickpeas, sometimes the texture isn’t my fave and I decided to puree them in the Vita-Mix to create a thick curry stew. 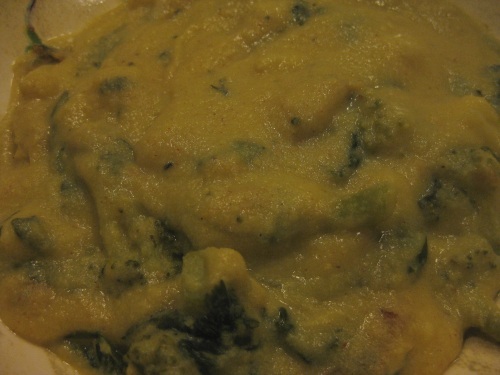 Blend all ingredients in a high-speed blender to a smooth puree and pour mixture into a large soup pot over medium heat. Add veggies to the soup base in the pot and simmer over medium heat for 30 minutes stirring frequently. Add salt and pepper to taste and enjoy. Makes 4 servings. For an experiment, it came out really good. 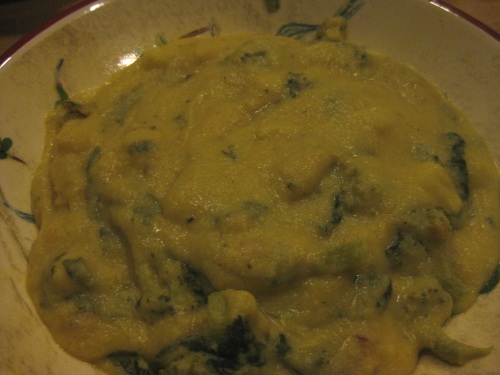 I really liked the smooth, custard texture of the chickpeas – like a savory pudding. For me, the curry flavoring was a little mild, but I tend to like it on the stronger side, often too strong for hubby. Glad you got the mud run done and great job being in the top 20% ! 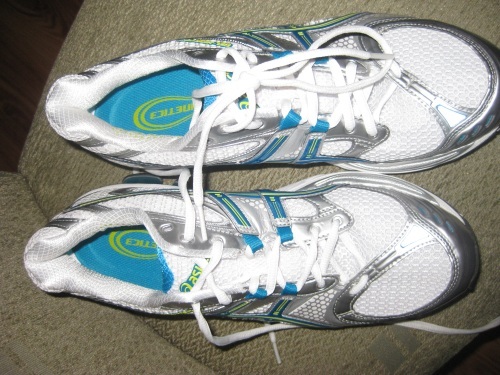 As for the shoes…I have never worn asicis. I am loyal to nikes b/c i have long thin feet and they work for me but keep us posted in a month or so how you’re liking the asics and if you think that going up a 1/2 size was a good move, long term. I am in between an 10.5 and an 11 in mens. I always buy the 11. If i were to buy an 11.5, I’d be swimming in them! I didn’t go a full size up because I was worried mine would be swimming too. Nice race! That stew looks absolutely delicious! I’m adding it to my recipe file! I lovvvve my asics! I’ve run in Nimbus’ for the past few years, and they work really well for me. I considered Nimbus’ too, they’re very highly rated and have more color options. Maybe for my next pair which will be in a few months at this rate! Ooh, that salad looks fantastic!